In my role as one of the leaders of Syniverse’s environmental sustainability efforts, I have the good fortune to be a part of a program that is rewarding on a number of levels. Not only does our program help preserve more of our natural resources, it helps us implement more efficient business operations, motivate our colleagues to help local communities, and share our unique capabilities beyond the business world to better benefit society. And this month it became rewarding in another way. Our summer fellow from the Environmental Defense Fund (EDF) Climate Corps who spent 10 weeks with us earlier this year, Meaghan Krohn, was just named to a “Top 25 Under 25” list by 2degrees, a sustainability news site and collaboration platform. The list profiles 25 people under the age of 25 that 2degrees selects as the top young professionals working in sustainability today, based on their personal applications, sustainability accomplishments and professional recommendations. 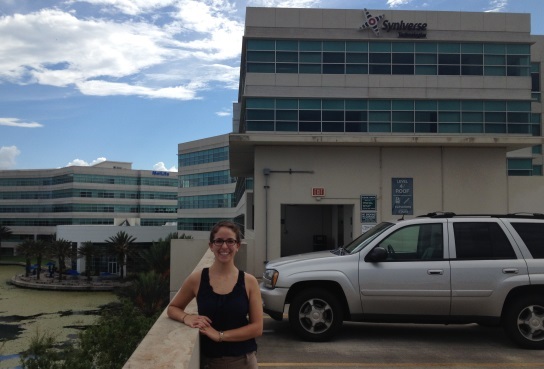 Meaghan at Syniverse’s Tampa headquarters building in August. Meaghan is one of three EDF summer fellows we’ve had the pleasure to host, and we couldn’t be more pleased with her contributions. Over the past three years that Syniverse has participated in the Environmental Defense Fund’s (EDF) Climate Corps summer program, we’ve been able to significantly strengthen our sustainability goals and gain the opportunity to work with some of the best and brightest young minds in sustainability. 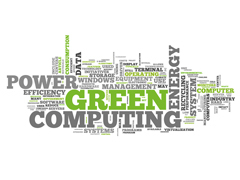 The program places specially trained master’s degree students at more than 100 companies, cities and universities, where they spend 10 weeks helping organizations identify and analyze strategies they can use to implement more eco-friendly business practices. Meaghan’s “Top 25 Under 25” honor is an exciting validation of the increasing role that sustainability is playing, and one more rewarding part of Syniverse’s sustainability program. I invite you to read Meaghan’s profile, learn more about her summer experience at Syniverse and gain one more example of how sustainability is transforming the corporate world. It’s a trend that we’ve done our best to support through efforts like our EDF participation, and a trend that we look forward to building on in years to come. I invite you to share your thoughts on sustainability, too. Do you think the EDF Climate Corps and programs like it will be adopted by more and more companies as sustainability becomes an increasing priority for businesses? Please leave me a comment.